What do you find the most stressful about entertaining? The menu planning? The cooking? The presentation? Do you sigh when you find a vegetarian at your table - or groan at the thought of thoseeven trickier gluten-free guests? Is matching wine with food a mystery to you? Do you wish you could whip up a delicious pre-dinner cocktail or serve up an authentic Vietnamese feast? Does your food look messy rather than Michelin standard? If so, we have the answers at sainsburysmagazine.co.uk. Happily, according to a recent survey* those who find entertaining at home stressful are in the minority (38%), while more than 72% of people think entertaining at home is more popular than ever. 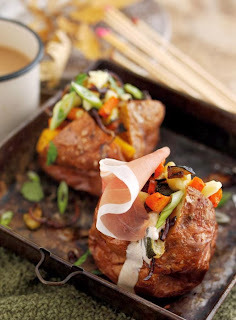 Make sure your night goes off with a bang by preparing these bonfire jacket potatoes with Parma Ham. Rub large baking potatoes in olive oil, salt, pepper and smoked paprika and put them in the oven to bake. To make the filling, combine cubed carrot, yellow pepper, courgette, red onion and drizzle with olive oil to roast. Once cooked, split the potatoes and fill them with the roasted vegetables, soured cream, feta cheese and spring onions. To serve, top with coriander and a slice of Parma Ham. Surprise your Halloween guests with these tasty Parma Ham and pumpkin slices, simple and fun for all of the family to prepare! Combine pumpkin seeds, chilli flakes, lime zest and juice, season and cook until crunchy. Slice the pumpkin and cover with walnut oil, runny honey and thyme leaves. Roast until caramelised. 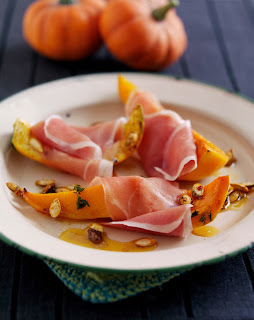 Wrap the pumpkin slices with Parma Ham and serve drizzled with the spicy lime pumpkin seeds. Opening to the public on October 16th 2013, 5&33 is the latest addition to Amsterdam's buzzing dining and cultural scene, combining art and food in a fun, playful environment designed to stimulate all the senses. 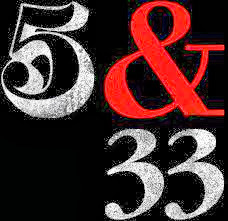 5&33 incorporates an all-day and late-night kitchen, cocktail bar, library, lounge and multi-functional public gallery. Europe's largest interactive art installation dominates the venue, created by innovations studio Present Plus. Diners can also enjoy unique sculptures and artworks by contemporary Dutch artist Atelier Van Lieshout. The 5&33 concept and menu was driven by Chef Daniele Pampagnin who oversees a kitchen team led by Head Chef Mattia Pedroni. Together, both Chefs forged their careers within renowned international members club group Soho House as well as the highly successful TOZI Restaurant & Bar in London. 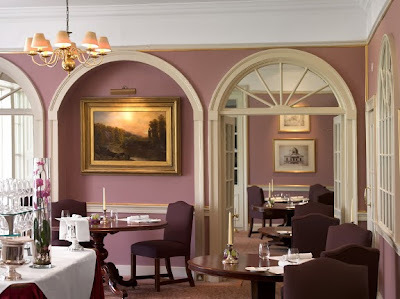 There is now just one month to go until the third annual Devonshire Food Festival, with a whole range of dinners and demonstrations taking place from Monday 18th November - 24th November. Taking place at The Devonshire Arms Country House Hotel on The Bolton Abbey Estate, it promises to be a real foodie feast for all involved! The week will include a variety of live chef demos, light-hearted lunches, afternoon teas, Michelin star dinners, and Chef vs. Chef Events - where two chefs compete against one another to win diners' votes. Chefs confirmed for this year's culinary extravaganza include new Burlington Head Chef Adam Smith, who has joined Devonshire Hotels & Restaurants from The Ritz, Swinton Park 3 AA Rosette Award-winning Head Chef, Simon Crannage, Head Chef at The Devonshire Fell, Oliver Adams, and 'Great British Menu' contestant and local chef, Stephanie Moon. Each year it can be easy to dread the thought of throwing the perfect New Years party. But with Opies' wide range of products that will spice up a number of drinks to make sure you can throw the best night for your guests. First off, why not try a spicy yet festive addition to your cocktail selection by creating a variety of drinks with Opies Stem Ginger. It is a tasty addition to a Ginger Fizz, made from cranberry, apple, finely chopped Stem Ginger and cider, which will be a festive favourite at any party. For an extra ginger kick, why not drizzle the ginger syrup from the jar into the drink as a final touch. The Stem Ginger syrup can also be a delectable treat put in a Ginger Snap Martini, made by mixing Vodka, Ammeretto, syrup and topped off with Opies Crystallised Stem Ginger. Ian Pengelley's Masterclass Is Back At Mango Tree! 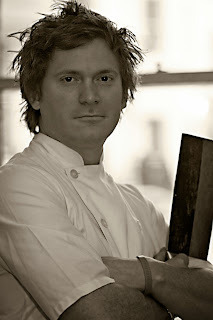 Mango Tree is excited to present our masterclasses with the critically acclaimed, celebrity chef Ian Pengelley. 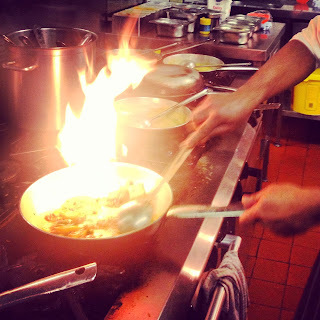 Guests will be treated to interactive cooking demonstrations, cocktails, and a three course meal consisting of fresh, authentic Thai dishes. Ian will also be talking to guests, answering questions and giving a unique insight into Thai cuisine and culture. Ian spent most of his childhood living in Hong Kong where he realised his passion for Asian food and culture. With a strong understanding of Cantonese Ian went on to train in Singapore, Thailand, Malaysia, Vietnam and China before returning home to share his passion for the Orient. 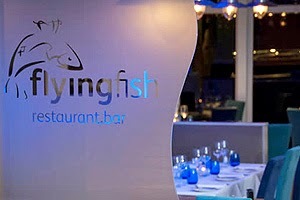 He now brings his knowledge and experience of Thai cuisine to the flourishing Mango Tree group. The UK's first power-packed ultra-filtered extra virgin olive oil is set to take the food world by storm. 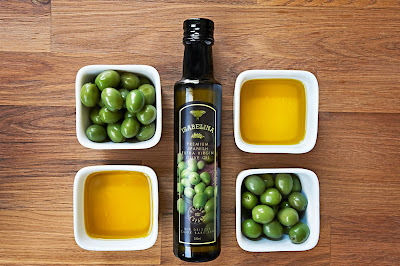 New Isabelina Premium has been launched by Isabelina Trading Company to satisfy a soaring growth in UK olive oil consumption coupled with consumer demand for healthier products. A revolution in olive oil production, the unique ultra-filtration method removes all impurities and sediment from the oil without affecting flavour and crucially levels of the health-boosting anti-oxidant nutrients. The superior standard Isabelina Premium Extra Virgin Olive Oil now offers discerning olive oil fans in the UK a true mix of tradition and technology packed into a superb quality Spanish oil. Will The Supermarkets Follow Steve's Leaves' Example? Steve's Leaves has responded to figures released today by Tesco that 68 per cent of salad bags are thrown out - 35 per cent of it by customers - by reiterating its commitment to producing salads in smaller bags ranging from 50g to 60g, which can all be used in one serving. Before its launch in 2010, a huge amount of research into the leafy salads industry about portion size was carried out by Steve's Leaves to ensure waste was kept to a minimum. Says Dr Steve Rothwell, founder of Steves Leaves: "Food waste is a major problem for the leafy salads industry but as a brand we are committed to reducing food wastage by making sure that our salad bags are suited to our customers' lifestyles and are used in one serving, rather than languishing open in the fridge for days before being thrown in the bin." UK taste buds are changing with Brits shunning their usual Ketchup and Brown sauce for stronger more exotic flavours[i]. 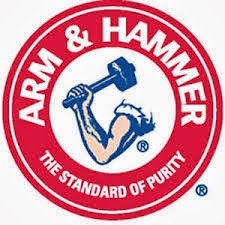 If you're part of this flavoursome uprising, are hungry for unconventional taste experiences and have a firm sense of adventure, then the team at Arm & Hammer have got just the thing for you. Introducing the 'Challenge Ordinary, Taste Life' campaign. From closer to home opportunities to get your taste buds tingling with unconventional soda mixology activity at UK food festivals, to trips abroad to experience the tastes of the world, this campaign has everything an adventurous foodie could wish to sink their teeth into. Great chocolate is created like great wine. It's crafted, not manufactured. It's grown, not processed. It's savoured, not swallowed. And there is a great story behind every bean, every bar and every taste. For chocolate fans that want to go beyond the world of simply dark, milk and white but don't know where to start, Cocoa Runners is the answer. Not only does it deliver hand-picked craft chocolate bars directly to your door each month, it offers unique access to insightful tasting notes and information on the process and the makers. 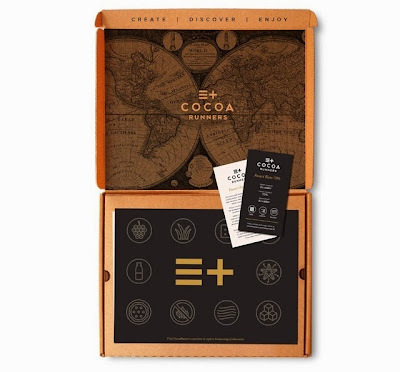 The experts at Cocoa Runners have scoured the globe to find the best craft chocolate the world has to offer - all natural, no additives, made with high quality, ethically sourced beans by highly skilled chocolate makers from Brooklyn to Budapest, Cleethorpes to Copenhagen, San Francisco to Saigon. With the new Head Chef Andy Smith firmly entrenched in his new role and as the air gets chillier and the evenings draw in, what better way to spend your Sunday than with a long, lazy Sunday lunch. Choose between roast sirloin and slow roasted belly pork for a contemporary take on a traditional Sunday lunch, or opt for the piscatorial passion that serves the restaurant so well with smocked haddock and clams or a vegetarian Pearl barley risotto with two courses for £15 and three courses for £20. Wines are expertly paired to each dish perfect for a sumptuous Sunday afternoon, and with views of Gyllyngvase Beach and Falmouth Bay why not let time wash by in the award winning restaurant. Let's celebrate the coming of winter with long lazy Sundays by the beach. 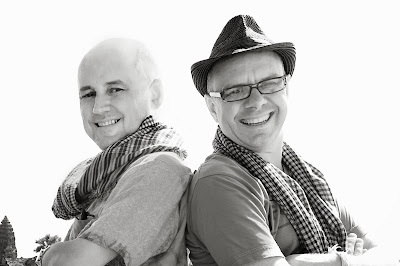 The boys at Globetrotting Gourmet have a full dance card, hosting upcoming tours to Hanoi over the holidays, Burma/Myanmar in April '14 over the Water Festival, and the upcoming launch of their new book, The Burma Cookbook, published by River Books. They'll soon be touring on a two-month promo blitz across over the new year, but the best news is that there are seats still available on all their upcoming food tours. 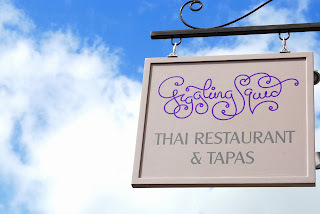 Giggling Squid To Open On Horsham's "Eat Street"
On target to become the country’s first national Thai chain, Horsham will be Giggling Squid’s ninth outlet and its fourth in Sussex – adding to those in Hove, Brighton and Crawley. In a prime pedestrianised location, the new 100-seater restaurant will be set over 2 floors. East Street, known locally asa “Eat Street”, is already home to several major dining chains including Wagamama and Cote. The passion and success of the South West food and drink industry was clear for all to see at the Taste of the West Awards' Ceremony on Tuesday 15th October. The ceremony took place at The Bristol Pavilion, the home of Gloucestershire County Cricket Club, and saw the 166 Gold award-winning products competing for the 22 'Best Of' category awards and prestigious 'Champion Product'. 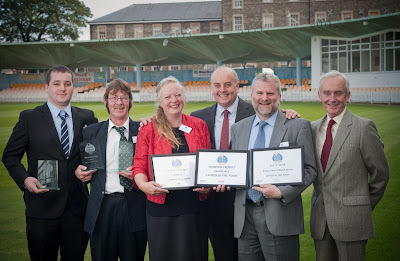 Dorset's Capreolus Fine Foods was victorious, taking home the coveted 'Champion Product' for their Guanciale. Divine Chocolate, the farmer-owned chocolate company, is delighted to announce the winners of the competition launched last year to find two new chocolateers. 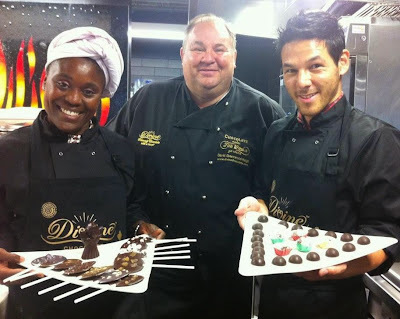 Erik Houlihan-Jong and Gloria Lilley now join David Greenwood-Haigh as the three Divine Chocolateers, offering delicious Divine demos and workshops. The pair will be joining Divine on the Divine Chocolate stand (no 56) on Saturday 19th October at the world-famous Salon Du Chocolat show at Olympia to talk about their personal passion for chocolate, and will have some home-made chocolate treats to give away. To be considered for the role Erik and Gloria both submitted a five minute video of themselves cooking with chocolate in the kitchen whilst talking to the camera about their passion for food. 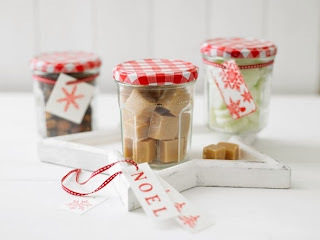 The pair have since been trained by chef and chocolate expert David Greenwood-Haigh who has worked with Divine for 8 years, and has since set up his own chocolate workshop business. Paul Hollywood and Mary Berry, stars of the BBC Two hit series The Great British Bake Off, will open the doors of the BBC Good Food Show Scotland on Friday. 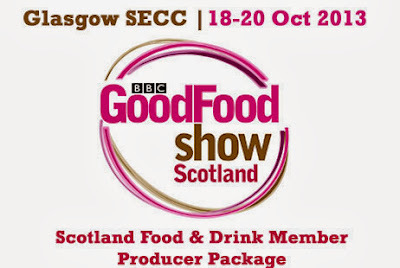 The Show will celebrate Scotland’s fantastic food heritage as Scottish producers head to the SECC, Glasgow from all over the country to sample and sell their specialties to thousands of food loving visitors. Several renowned chefs and experts will gathering in Scotland for the three day event to demonstrate their skills and recipes on the 950-seat Supertheatre, sponsored by Tesco finest* including James Martin, Si King: The Hairy Biker, Tom Kitchin, John Torode and Ade Edmonson, winner of Celebrity Masterchef 2013. An exciting new addition to the show for this year, devoted to all things baking. A place to learn new techniques and buy everything needed to bake like the experts. After a welcoming tea or coffee, and crackers & chilli dips, the group handle the all-important Thai ingredients, then experience mixing, grinding and frying ingredients for Green Thai Curry Paste. For a mid morning tasting, we make SOM TUM SALAD (Papaya) and it's exquisite Thai dressing. Then it's onto the main course: THAI GREEN CHICKEN CURRY, using the fresh paste we made earlier and we show the right way to cook rice noodles for PAD THAI, with beansprouts immersed in a fragrant sauce. A fast-to-make vegetable dish is tasty PHUKETT GREENS, with garlic, red chilli and oyster sauce. We make a novel BLACK & WHITE RICE using Jasmine Rice and Thai Black Rice. All cooked from scratch, followed by a good plateful of everything for each to enjoy, with free wines. Full colour recipe sheets included. 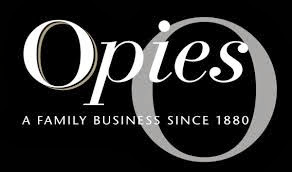 Opies, one of the oldest, family run independent food companies in the UK, has recently introduced a new range of chutneys to Waitrose. The chutneys have replaced the Garden of England range which, and the new chutneys have been redeveloped with a new recipe and Opies branding. The Chutneys are made using only the finest produce and are available in two flavours, Bramley Apple with Biddenden Cider and Plum with Claret. The chutneys are delicious when paired with a range of different meats and are a great way to add extra flavour at meal times. The finest Claret is used the production of the Plum Chutney, creating a perfectly flavoured accompaniment to poultry, pork and game, whilst the Bramley Apple Chutney with Biddenden Cider is made using 100% British apples and cider from Kent, the home county of Opies, creating a traditional flavour. Brown Cow Organics are delighted to announce they have been awarded the first Good Dairy Award in the 2013 Good Farm Animal Welfare Awards by Compassion in World Farming; recognition indeed of their commitment to farm animal welfare. Compassion's Good Dairy Award launched in 2011 - celebrates and recognises companies that are committed to using higher welfare dairy systems for cows and calves. Tracey Jones, Director of Food Business at Compassion in World Farming said, "It's wonderful to see Brown Cow Organics take animal welfare so seriously as part of their herd and food produce ethos. Higher welfare produce isn't just the responsibility of the large corporations, but something that can be achieved at all levels. Well done Brown Cow Organics- keep up the good work!" These mini bonfire burgers are a fun and simple way to entertain your guests this winter. 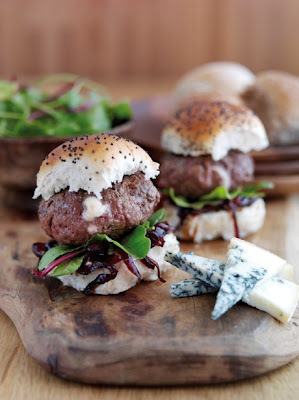 The burgers combine flavoursome Gorgonzola cheese, a product of Protected Designation of Origin (PDO) with Welsh Beef, a product of Protected Geographical Indication (PGI). Mix the minced Welsh Beef, mustard, garlic and egg yolk to form mini patties and season. Fill the patties with chunks of Gorgonzola, sandwich them together and leave to chill. Cook the burgers under the grill and top with salad and caramelised onions to serve. Gorgonzola is a high quality cheese guaranteed by production rules with an unmistakable aroma and taste and a history which allegedly dates back to the eighth century. There are currently 40 dairies and over 3,000 farms making milk for the production of Gorgonzola cheese! 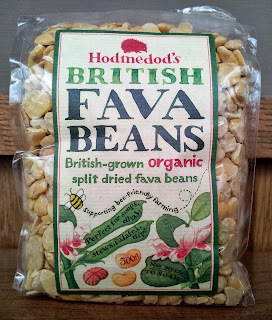 Hodmedod is launching the first British-grown organic split fava beans – the latest step in the revival of a healthy, versatile and delicious ingredient that's good for bees, the environment and the UK’s farmers. Fava beans have been grown in Britain since the Iron Age and were once a major part of the British diet as a year-round source of protein. However, they fell out of fashion with rising consumption of meat and dairy products. One UK company is working to reintroduce the bean after seeing it exported to countries in North Africa and the Middle East. Hodmedod, based in Norfolk, was founded after a trial project to see if people in Norwich would like to eat this locally produced source of vegetable protein – they did! 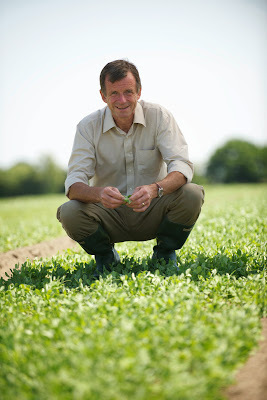 The business launched an initial range of British pulses in early 2013 and is working with growers to source and trial different varieties of beans and other crops. The average person gains 5lbs over Christmas - enough to make your clothes too tight or tip you into the next size up. Alcoholic drinks can be a sneaky source of calories, sugar, and even salt — but Martin Miller's Gin has got the answer this year with two perfect low calorie festive drinks to be enjoyed without piling on the pounds. 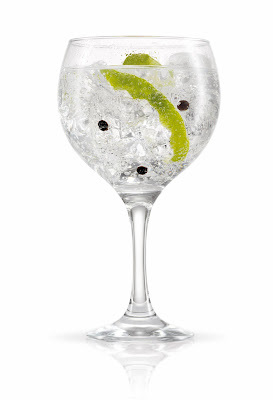 Mulled wine is fine, but if you're looking for something a bit different this Christmas, gin is in. Martin Miller's has created its Merry Mulled Wine - the perfect warming tipple to welcome guests at only 65 calories a glass. With The Great Gatsby, Downton and Mad Men fuelling the premium gin revival, the mixologist's favourite gin has created the spin on the traditional mulled wine recipe and it's guaranteed to go down a storm with discerning juniper-loving drinkers and those watching their waistline.